According to rental site Zumper, median rents in San Francisco are $2,532 for a studio and $3,412 for a 1-bedroom apartment. To help you visualize those numbers, we've rounded up several apartments that are listed at $3,000/month or less. Note: these prices and availability are subject to change. Listed at $3,000/month, this 1-bedroom, 1-bathroom apartment is located at 1107 Page St. In the unit, expect wooden cabinets, a mix of hardwood and tile flooring, exposed brick, a deck and a walk-in closet. When it comes to building amenities, anticipate on-site laundry; neither cats nor dogs are permitted. Per Walk Score ratings, the surrounding area is a "walker's paradise," is quite bikeable and is a haven for transit riders. Next, there's this 1-bedroom, 1-bathroom apartment located at 2150 Taylor St. that's listed at $2,999/month for its 600 square feet of space. In the unit, there are hardwood floors, a walk-in closet, a balcony, large windows and an oven. Pets are not welcome. According to Walk Score, this location is extremely walkable, is quite bikeable and boasts excellent transit options. Here's a studio apartment at 1201 4th St. that's also going for $2,999/month. In the unit, you'll get hardwood flooring, both air conditioning and central heating, high ceilings and floor-to-ceiling windows. The building features on-site laundry, garage parking, outdoor space, a swimming pool, a fitness center, on-site management, a residents lounge and a business center. Both cats and dogs are allowed. According to Walk Score, the surrounding area is extremely walkable, is easy to get around on a bicycle and has excellent transit. Next, check out this 611-square-foot, 1-bedroom, 1-bathroom condo that's located at 555 Innes Ave. and is listed for $2,995/month. In the unit, you'll find hardwood floors, a dishwasher, in-unit laundry, a walk-in closet, garden access, a balcony and stainless steel appliances. When it comes to building amenities, expect assigned parking, outdoor space, a roof deck, a bike room and secured entry. Cats and dogs are not welcome. Per Walk Score ratings, the surrounding area is car-dependent, is somewhat bikeable and has a few nearby public transportation options. Next, check out this 800-square-foot, 1-bedroom, 1-bathroom apartment that's located at 401 30th St. and also listed for $2,995/month. In the unit, you'll get hardwood floors, French doors, high ceilings, granite countertops, stainless steel appliances, wooden cabinets and large windows. Building amenities include on-site laundry. Cats and dogs aren't permitted. According to Walk Score, this location is friendly for those on foot, is convenient for biking and is a haven for transit riders. 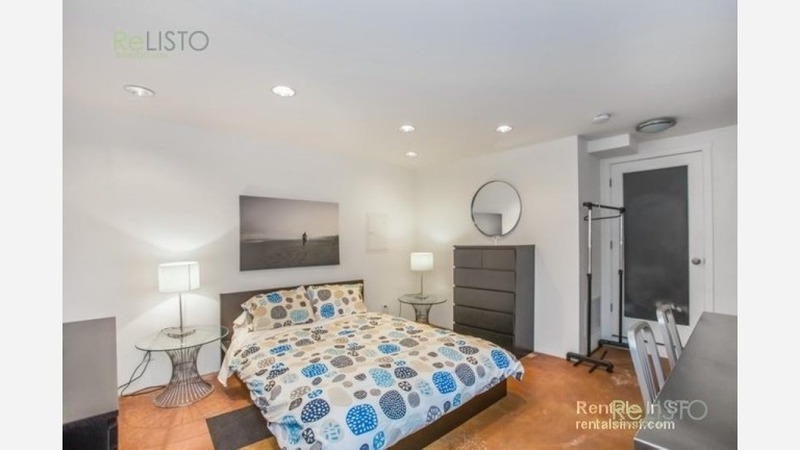 Listed at $2,995/month, this 1-bedroom, 1-bathroom apartment is located at 2460 Larkin St. In the unit, tenants will find hardwood floors, large windows, a dishwasher, wooden cabinets and ample natural light. Expect an elevator and on-site laundry as building amenities. Cats and dogs are not welcome. Walk Score indicates that the area around this address is very walkable, is fairly bikeable and has excellent transit. Next, there's this 1-bedroom, 1-bathroom apartment over at 2420 Franklin St. that's listed for $2,995/month. In the apartment, there are hardwood floors, large windows, stainless steel appliances and closet space. The building features on-site laundry and garage parking. Pet guardians, inquire elsewhere: this spot doesn't allow cats or dogs. According to Walk Score, the surrounding area is extremely walkable, is convenient for biking and has excellent transit. Tenants can expect stainless steel appliances, wooden cabinets and carpeted floors. No pets. According to Walk Score, this location is extremely walkable, is very bikeable and boasts excellent transit options. Then there's this 1-bedroom, 1-bathroom apartment at 9 Nobles Alley that's listed for $2,995/month. In the unit, you'll find a mix of hardwood floors and carpeting, stainless steel appliances, wooden cabinets, high ceilings and a dishwasher. Pets are not allowed. According to Walk Score, this location has excellent walkability, has some bike infrastructure and has excellent transit. Located at 388 Fulton St., here's a 480-square-foot studio apartment that's listed for $2,985/month. In the unit, you can expect hardwood floors, in-unit laundry, closet space, floor-to-ceiling windows, a dishwasher and ample natural light. Amenities offered in the building include a roof deck. Cats and small dogs are allowed. Per Walk Score ratings, this location is a "walker's paradise," is a "biker's paradise" and boasts excellent transit options.